Navigating the Canadian tax world can be complicated. This is why we created a master resource to address all of your tax questions. From the fundamentals of filing taxes to the tax nuances between provinces, you can find your answers here. We are committed to helping small business owners, non-profits and contractors maximize their tax deductions to keep more of what you earn today. A tax return must be prepared and filed annually and the 2018 deadlines vary based on your business type. Businesses can start filing taxes with the CRA. Businesses should target sending T4s and tax slips by this date. Most small business taxes are due. There are also certain scenarios where it might make more sense for you to pay your taxes in four installments throughout the year. But, this is only relevant to independent workers or contractors who owed over $1,800 in net taxes in 2017 or choose to voluntarily send installments for easier budgeting. If you file late, you will be required to pay 5% on what you owe with an additional 1% of the balance for each full month that your return is late. The CRA does grant extensions for certain extreme scenarios, but it is important to file on time to avoid penalties. As a business owner, you can prepare for tax season throughout the year by using a business credit card and checking account, keeping detailed logs of expenses and uploading your receipts digitally. You also have to decide how to file your taxes. Many business owners opt to hire an accountant for tax time or see the benefits in using an accounting software year over year to walk them through the process. You can also access the CRA My Business Account personally to ensure all of your information is up to date, access your payroll, make a payment, file a rebate and much more. Some Canadian business owners are also opting to file via Net File or accounting softwares such as QuickBooks. You can contact the Canada Revenue Agency’s via a free support services or at the CRA phone number, 1-800-267-6999. What do you need to gather at tax time? Here is a master checklist for filing taxes outlining the crucial reports and documentation that you need to aggregate. There is also technology that can help you throughout the year or at tax time including apps that track receipts, time and inventory. To make the process seamless and reduce stress, there are many tactics that you can do throughout the year to avoid overpaying on taxes and even some loopholes that you should be aware of. This ranges from using a business credit card for purchases to incorporating your business legally instead of claiming all profits as your income. Some self-employed professionals also practice income-splitting when a spouse is also a business partner, elect to pay family members, or switch personal assets to business assets to maximize savings. If you have employees, there are also many employee tax considerations that you need to know to manage your business. This ranges from determining if you elect to pay for their parking (this is a taxable benefit) to providing technology. Both the CRA and QuickBooks provides calculators and other tools to walk you through the process of calculating certain types of taxes. If your business makes over $30,000, you are required to charge your customers sales tax (GST/HST) on all purchased goods and services. However, there are ways to save money by calculating a tax credit. Learn how to figure out your net tax. Many business assets, such as machine equipment or cars, depreciate year over year with use. Is is helpful to calculate the depreciation rates to understand when is the best time to get rid of equipment and rebuy. As an employer, you have to calculate the deductions from your payroll. 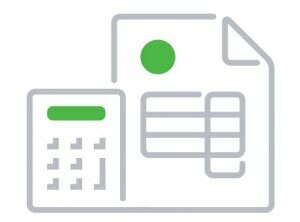 QuickBooks Canada has a payroll deductions online calculator for all people with the exception of Quebec. To understand what to gather and how to use it, you should take a few minutes to learn the ins and outs of the payroll deductions. You have the ability to subtract business expenses from your tax return. However, it is important to note that the CRA has different classes which guides you to what percentage you can take from the cost of each expense. Get more examples based on your business. Employers typically withhold taxes from paychecks as if the employee gets paid the same for the duration of the year. But, what if there is a large bonus or commision structure? This is where the bonus method comes into play. You make an educated guess on base pay plus the employees bonuses for the year. Then, look at the tax bracket and determine how much more to withhold. If you require your employees to drive, you may need to account for this in your pay cheques. Luckily, the CRA offers an online calculator and we have a comprehensive taxable automobile benefits guide to show you how to use it easily. Cross-border shipping is sometimes a necessity and profitable. However, there are nuances to the tax laws that will allow you to determine if it is worthwhile to import. Learn how to calculate your duties prior to making that crucial decision with the cross-border shopping duty & excise taxes guide. What it Does: This is a form that self-employed professionals and small business owners use to report their income and expenses to the CRA. We will break it down for you here. What it Does: These slips are for businessess who elect not to use QuickBooks software and manually list what you paid to your employees over the calendar year. Learn how to complete your T4 and avoid common mistakes. What it Does: As a small business, you might require your employers to use personal cars or other materials that your employees can claim these deductions personally. However before they can do this, a small business has to show the government that this is permitted and truthful. Learn what’s at stake for you with FormT220. What it Does: If you are a partner in a business, it is essential that you report your share of the business. To understand those nuances and better understand how to file, check out our T5103 guide. What it Does: If you are hiring an American that is a contractor, learn the essential steps for ensuring the 1099 is completed accurately. Need to make changes to any of the tax forms? Find the path of least resistance here. If your business is not publicly traded and based in Canada, there are tax write offs and deductions that you should be aware of. Our comprehensive deduction guide breaks down the differences between a tax credit, how to claim them and steps to determine if it applies for you. We also have a master list of business expenses that you can deduct to help you prep for tax time and broke down a few of the applicable expenses below. Do you need quick answers? Find the key definitions and business examples you’ll need for all of your tax questions — with more information available in the below links. A business number is a series of nine digits that the Canada Reserve Agency (CRA) uses to identify your business in communications with the federal government. Businesses with at least one employee typically need to register for a business number. A corporation key is a password assigned by the CRA. You can use this to access the Online Filing Centre, which processes your business’s tax information. A deferred tax is a current tax payment that you push into the future, often through an investment or retirement account. Inflation and payment control are the main benefits of these taxes. Excise duty is a tax charged on certain Canadian products, such as wine, spirits, and tobacco. These products incur excise duty at the point of manufacture before they are sold to customers. A fiscal pardon is a type of tax amnesty that allows you to rectify any unpaid, unfiled, or unreported taxes from previous years without fear of large fines or criminal penalties. To take advantage of this tax pardon program, you must apply with the CRA. An inclusion rate is the rate that the CRA uses to determine taxable capital gains and allowable capital losses. This helps you figure how the profit or loss from the sale of property fits into your tax return. Marginal income and marginal income tax may sound similar, but knowing the difference is key to running your business. Marginal income refers to the difference between sales revenue and variable costs, and marginal income tax refers to tax brackets. Marginal and effective rates can help you develop a strategy for a tax year.Marginal tax rates are based on the income tiers that the Canada Revenue Agency uses at the federal level, and your total tax liability as a percentage of your income is your effective tax rate. NOPAT is a simple formula: revenue minus operating expenses minus taxes. This measures your company’s after-tax profit typically used to compare financial results over time — or to calculate economic value added. Old age security clawback refers to the pension you receive if you’re 65 years or older — and if the Canadian government takes back money that it previously paid. This commonly occurs when the government imposes a special tax on old age security payments for certain individuals or income levels. Operating leases and capital leases are both options when you need buildings or equipment for your business. An operating lease allows you to occupy property without the risks (or benefits) of owning it, while a capital lease gives you ownership rights in the property you’re leasing, while the lessor finances it. A payment “in lieu” of taxes is what you pay the federal government instead of paying taxes. This typically comes up when the government compensates a municipality for services (such as water, roads, garbage, etc.) without giving up its overall tax exemption status. A prepaid asset is a financial resource available for future use. You can use it over time, or it may be something you benefit from down the road. Provincial and territorial corporate tax rates are the rates that provincial and territorial governments levy on your corporate profits. This is one factor in how much you’ll pay on taxes. The acronyms PST and TVQ/QST both relate to sales tax. PST stands for provincial sales tax, which is applied when a province doesn’t participate in the Canadian harmonized sales tax. TVQ/QST stands for Taxe de Vente du Québec/Quebec Sales Tax, which Quebec collects on sales or supplies of most services and property. A refundable tax credit lowers what you owe to the CRA and reduces your tax liability — even if you don’t owe any taxes or if it takes your liability to less than zero. A robot tax applies to your business if you’ve used a robot to automate a process or replace workers in your business. It requires you to pay the government a tax based on how much money each robot makes or the profits that come from the labour savings of a robotic workforce. A standby charge reports the benefit your employee gets when you make your owned or leased automobile available for their personal use. A transit number is a series of five digits that identifies your specific bank branch. This is the first series of numbers listed along the bottom of a cheque. GST/HST are different types of sales taxes that vary on the province in which your business resides. There are also some provinces where both PST and GST are due, only GST is due and others where HST is only required. All of these should be charged to customers and acquire varying degrees of percentages from a sale of a service or good. Your GST/HST typically has an annual reporting period, though you can adjust it to accommodate your increased sales and taxable supplies. There are also a few situations where you can avoid paying GST. The CRA also outlines certain scenarios where a good does not require a tax and exempt. This varies from school fees, child care services, used housing and more. There are also some basic livelihood goods that are charged a tax but at 0%. This zero-rated category is common for agricultural products and certain medical supplies. Understand the distinctions between taxable, exempt and zero-rated supplies. GST/HST is only applicable for businesses that make $30,000/per year; however, some choose to voluntarily register for a GST/HST Account and charge sales tax to their customers. (You can also close a GST account if need be.) One benefit to a small business is the ability to recover the taxes that you purchased for their business, also called input tax credits. Learn how to maximize your ITCS and record your expenses in QuickBooks online throughout the year. Taxes vary from province to province. So, there will be tax differences based on your business’ location. We have aggregated the most important things to note whether you operate out of Quebec, Manitoba, British Columbia, Saskatchewan or Ontario. Hover over the map to find the comprehensive, province tax guides. Taxes and legislation vary across industries. To break down these discrepancies, we developed our master industry taxes guide. You can also just navigate to what industry best applies to you. What Type of Small Business Do You Own? For tax purposes, the first step is determining whether you are a non-profit or a charity. Canada has detailed classifications and it is important to learn the differences between charity and non profits at tax time. For example, if you are advancing education or relief of people in poverty then you would be classified as a charity. However, organizations that are focused on sports or hobbies are classified as non-profits. If you are classified as a charity, you can issue tax receipts to your donors which can be given back to up to 50% of the donation. This depends on your province; however, it can be a huge selling point for recruiting potential donors. There is also a first-time super credit given to new donors which can help the cause. And, rules that vary based on political activities. All of receipt rules for registered charities should be thoroughly documented according to the CRA regulations and prepared ahead of time to make it easier at tax time. There are many tactics that businesses can deploy to ensure compliance with the CRA such as registering with the GST/HST, keeping accurate records and understanding the filing process. Regardless, sometimes a business is audited by the CRA due to the missed red flags. So, what actually happens if you get audited? You have two decisions – agree or disagree. If you disagree, you can opt for a note of objection. You can also agree and start preparing for payroll tax audits. Ultimately, the best option is to audit proof your business by avoiding revenue discrepancies, keeping a paperwork trail and declaring all of your income. QuickBooks Online can help you maximize your tax deductions. Keep more of what you earn today.